Our Angel in Heaven - Ryan Housholder - BFL 213 - BLIND FAITH LIVE!BLIND FAITH LIVE ! Real People. Real Miracles. One of our dearest friends, Ryan Housholder, 33, passed away this week. We send our deepest sympathies to his mother, Michelle Baucco Kapes; father, Bill; and brother, Randy. 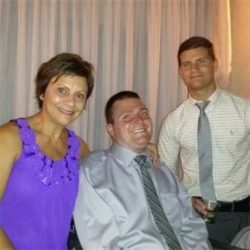 Ryan succumbed to an infection, after an 11 year battle with the paralysis that followed a diving accident. Ryan, always smiling, was in the midst of an impossible miracle. Under Dr. Issam Nemeh’s care, following the diving accident which had completely severed his spinal cord, Ryan was again feeling and moving. Listen as Dr. Nemeh, Kathy Nemeh, Randy Housholder, Philip Keller, and Ryan, himself, tell the beautiful story of a young man who found healing, and his faith, during his nine years of association with this faith-filled union. Dr. Issam Nemeh takes questions from audience members at a recent Dr. Nemeh healing service. Topics include: is anxiety and depression delivered to us directly from evil, what does Dr. Nemeh feel during a healing, should we feel guilty over asking God for healing, how science is attempting to direct us away from God, and what should we think about the recent protests in America? This entry was posted in Dr. Issam Nemeh, Episodes, Kathy Nemeh, Philip Keller, Trapper Jack and tagged Evil, Paralysis, Quadraplegic, Science by Philip Keller. Bookmark the permalink. I’m so sorry to hear about Ryan. My heart and prayers go out to his family and to all of you at BFL. We have another angel, another saint………helping us on our journey. A wonderful tribute for Ryan Housholder , you are all blessed. Another beautiful podcast. Thanks to everybody ,love to all. Beautiful experience just listening to this story! Thank you for this blessing!